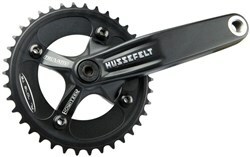 Before the Hussefelt, cranks arms were in a losing battle with the terrain. The Hussefelt features our proven AL-6066 alloy for higher strength. Where others use AL-6061 (like Truvativ uses on the 5D), the Hussefelt steps up to AL-6066 which is 30% stronger than AL-6061. Our cromoly pedal inserts set the standard for high strength pedal interfaces. The Howitzer BB is the weapon of choice for this bad boy.